Here is the third installment in our “A Week with the Leakes” series! If you haven’t already, check out the breakfast post and lunch post that we published last week. Also, please be sure to read our brief disclaimer about this series as well. 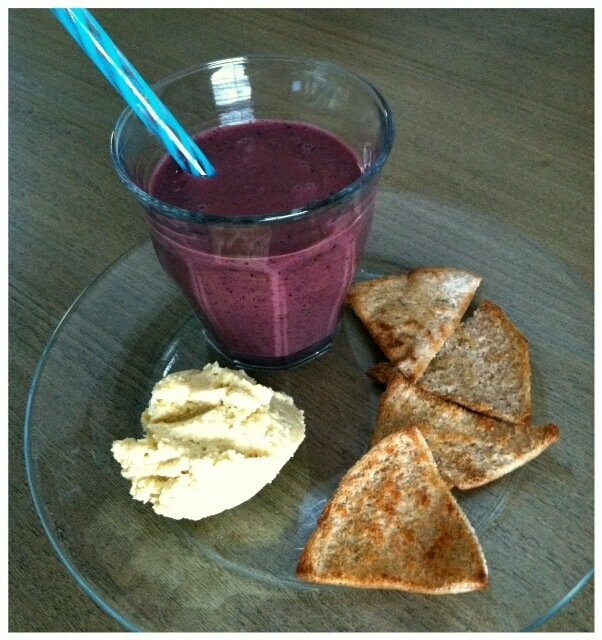 Monday After School Snack: Both girls had plain yogurt/berry/milk/banana and local Swiss chard smoothies (those were just the greens we had on hand from our garden) and some baked pita chips with hummus. I had a little bit of smoothie myself. 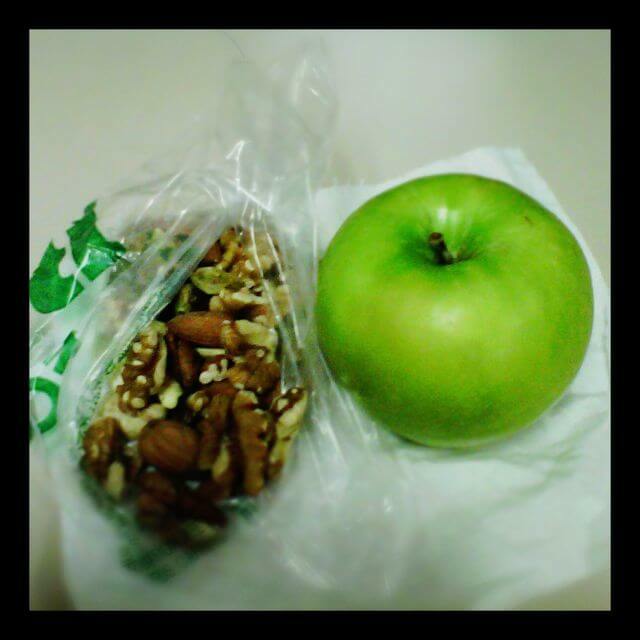 Jason’s Monday Afternoon Snack: Mixed nuts and an apple. 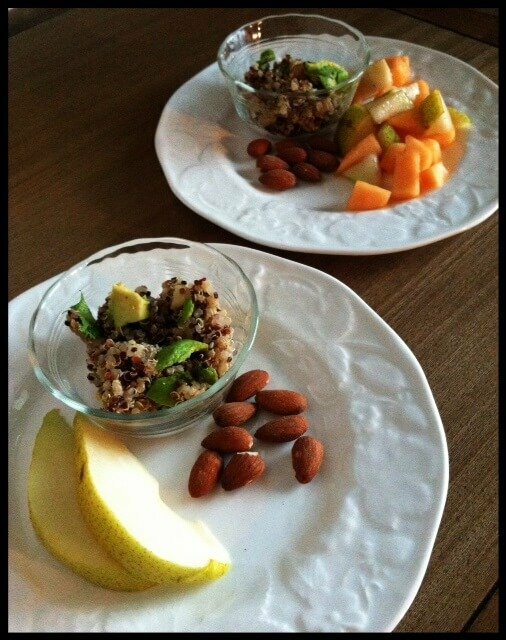 Tuesday After School Snack: Leftover quinoa from dinner the night before, the pear/cantaloupe one child did not finish from her lunch, fresh slices of pear for the other child, and roasted almonds. I had a little bit of almonds and pear. 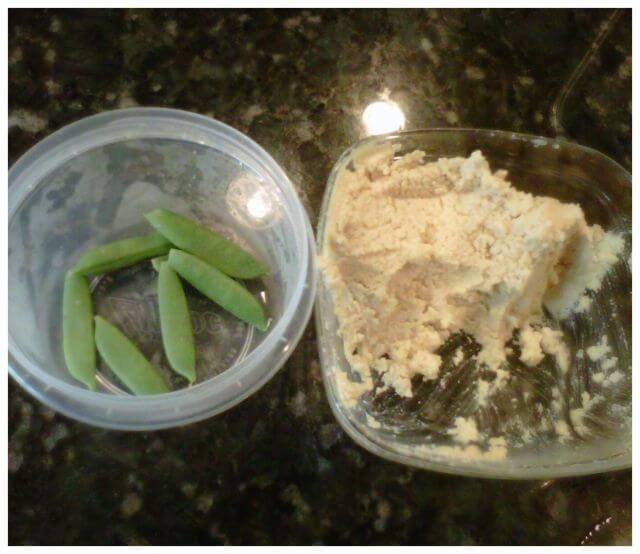 Jason’s Tuesday After Work Snack: Leftover local sugar snap peas and hummus. 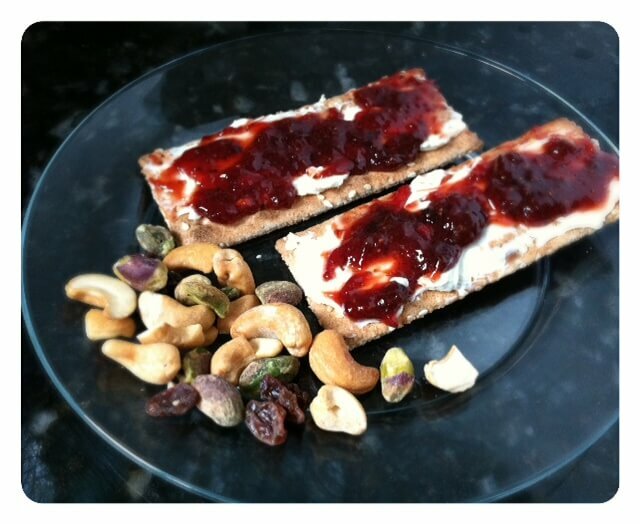 Wednesday After School Snack: Ak-Mak whole-grain crackers with organic cream cheese, homemade strawberry/honey jam, and trail mix (pistachios, cashews, raisins). The girls also shared a small PB&J whole-wheat pita. I only had the cream cheese/jam on crackers. 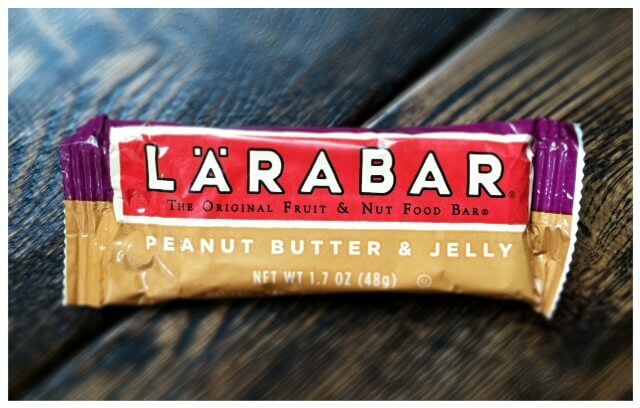 Jason’s Wednesday Afternoon Snack: A Lara Bar. 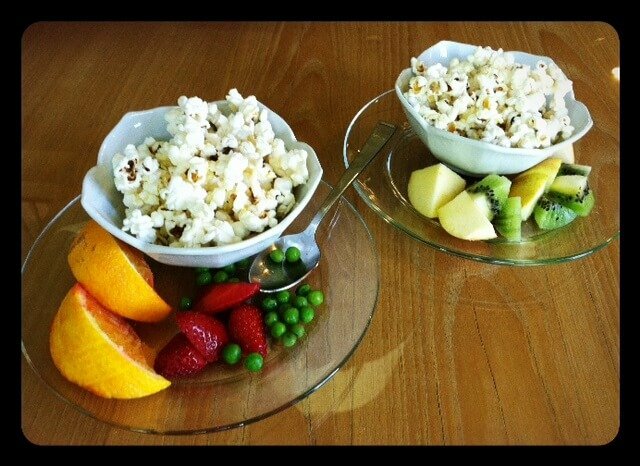 Thursday After School Snack: Popcorn, the fruit/veggies one child did not eat in her lunch, and fresh kiwi and apples for the other child. I had some popcorn and kiwi. 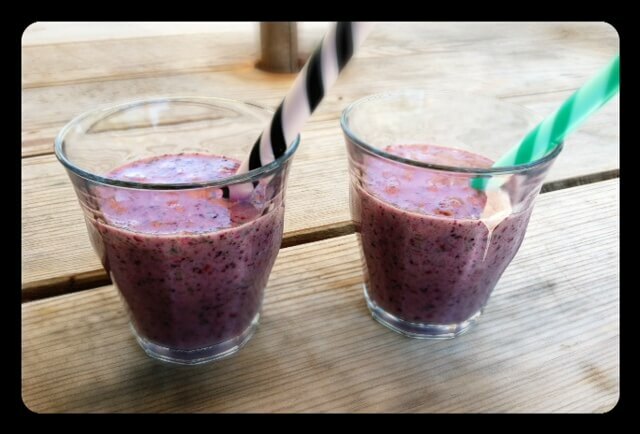 Friday After School Snack: Another batch of plain yogurt/berry/milk/banana and local Swiss chard smoothies. I had a little bit, too. Stay tuned for the dinner version of this series to be posted later this week! I love that snacks feature fruit and vegetable leftovers as well. I really need to do better about that! Glad you enjoyed it! We aim for a 6pm dinner but oftentimes it’s closer to 6:30 or 7 by the time we sit down and everything is ready. Where do you get the baked pita chips? Or do you make them yourself? They look delicious! Hi Sarah. Lisa discussed the “pita” chips in her recent lunch post. You can view it here https://www.100daysofrealfood.com/2012/05/17/a-week-with-the-leakes-lunch/. She made them by using the whole wheat pita bread from Trader Joes. I’ve found that adding spinach doesn’t alter the taste at all! With the ohter greens it depends upon how much you add. Like the other reader stated, spinach is probably your safest bet. It does not alter the taste and the texture also seems to be unaffected. You might want to start with that and then experiment from there. It’s not a leafy green, but I’ve found that cucumbers are fairly easily masked by the fruit flavors as well. I don’t know the nutrient difference between leafy greens and a cucumber, but I’d think it’s better than nothing. Your quinoa looks very good. Do you have a recipe? We love homemade trail mix…homemade oat and honey granola (also yummy as a cereal), nuts of some kind, sunflower seeds, chocolate chips, and raisins. Yummy! I love smoothies, but don’t make them often cause I’m the only one who drinks them. Great portion control for the kids! Especially incorporating uneaten parts of their lunch or leftovers into a “new” snack. I could really use some of that swiss chard from your garden this week! The grocery store stuff doesn’t even compare. After reading your post on lunches, I purchased the squeezie (sp?) pops from Amazon and now I fill them with something similar to your smoothie recipe. My son loves it!! It’s his new favorite “dessert” :). Thanks for this series, it’s awesome!!! You’ve given me so many ideas! Thanks for doing this! Loving the series and excited for the dinner/dessert post. I’ve noticed that I don’t see a lot of cheese. Are you all not big cheese eaters or is there another reason? I love that your snacks don’t include meat and there are lots of veggies. We need to cut back on the meat and multiply the veggies right now. Thanks for this! How funny…someone else commented and said we eat a lot of cheese. We actually love cheese (all kinds) and eat it pretty regularly. I am loving this series, so much inspiration! Thanks for sharing. I can’t thank you enough for your website! It has inspired me so much and now I am an avid ingredient label reader and am so much more conscience about what I am feeding my family! Thank you so much for so many informing articles and delicious recipes. You are an inspiration! I love how simple most of these are to put together. I’ve been over-thinking my daughteres snacks lately, but these would all be perfect for her. Thanks! This is a really interesting project! I am definitely one of those people who tries to avoid processed foods as much as possible, but sometimes the processed “shortcut” is too appealing. Maybe I will try to be more conscious and challenge myself to a week without processed foods. Also, any tips for a new blogger? My mom is starting a food blog called morethanamealmemories.com and I would love to share some tips about how you got to where you are with your blog. Thanks! Good luck to your mom! I would say it’s important to remember that good content is king. No matter what you do to drive people to your blog (and no matter how pretty it is once they get there) they are not going to stay or keep coming back if they don’t like the content you are providing! Since Lisa is giving such great information here is an article from Fooducate about this very thing that advocates exactly what Lisa is teaching. Fooducate is also an app for your iPhone that helps with good healthy food choices and it’s free. I would just like to say how much I appreciate that you encourage your girls to eat the food they did not finish from previous meals. This is a great lesson that seems to be lost on our society… it is okay to teach your children not to waste food. I commend you. Where are the smoothie straws and glasses from? They are both perfect for a little smoothie snack!